The Invisible Secret to weather-stripping your wood double-hung windows - Windowrepair.com, Inc. There have been many attempts to make double hung window tighter and more efficient over the couple of centuries they have been in use. Back in the day many homes throughout the Arlington, Auburndale, Belmont, Brookline, Cambridge, Chestnut Hill, Concord, Lexington, Melrose, Newton, Watertown, Waban, Wellesley, Weston and Winchester area installed an aluminum type tongue and groove weather-stripping which became common, known as “Integral Weather-stripping.” The aluminum weather-stripping material was counter intuitive to what it was intended for as it swells with the heat in the summer time when you want to open your windows but is easy open in the winter cold when you don’t want open your windows. If you have old windows with aluminum weather-stripping you know it causes your window sashes to operate very stiffly, locks to malfunction, and destroys the bump-out. After 50 years or more of over-painting and warping, the integral system usually gets so tight the windows barely operate, and then only with great effort. Windowrepair.com, Inc. Recommends replacing old aluminum tongue and groove with “Spring Bronze” Weather-stripping. 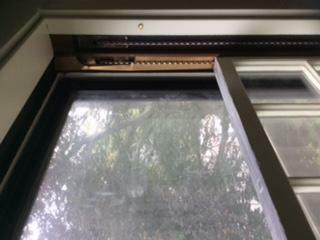 If it is desired to keep the integral system, we can make the windows easily operable by disassembling (yes, we know how to do this without destroying the metal weather-stripping, in most cases), sanding the sashes, and running a disc grinder through the grooves where the tongues insert. We remove the piece of metal from the back of the bottom sash, which was intended to interlock with the bottom of the top sash, but only serves to drag it down and make the lock mis-align. By re-setting a sweep lock to do its job, the meeting rails are locked together and the interlock is unnecessary. The Spring Bronze Weather-stripping we prefer to use in homes throughout the Arlington, Auburndale, Belmont, Brookline, Cambridge, Chestnut Hill, Concord, Lexington, Melrose, Newton, Watertown, Waban, Wellesley, Weston and Winchester area is a strip of metal as wide as the edge of a sash, which is fastened to the channel in which the sashes ride. It is stapled down one side, so the other side springs out. 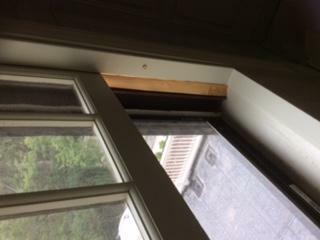 When closed, the sash is compressing the sprung surface, closing the gap between it and the casing, making a much more draft free assembly out of an old window. Some people advocate adding weather-stripping to the top, middle and bottom of the sashes. We find this mostly unnecessary – because those surfaces are designed to close solidly with a properly operating lock. Adding spring bronze to the top or bottom can make the lock difficult to operate, and any form of vinyl gasketing is a temporary solution because it will eventually wear out. 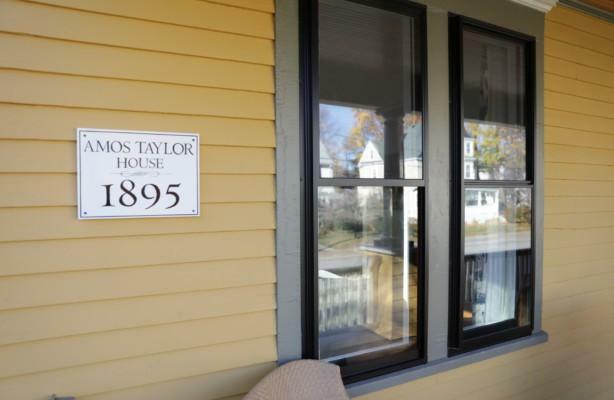 The real gaps in the old double hung system are in the sides of the sashes which were designed to hang freely in their tracks. Any friction; such as jamming the stops against the sashes or adding that felt backed stripping, is only going to make them impossible to operate in the summer- when humidity swells the wood and reduces clearances. 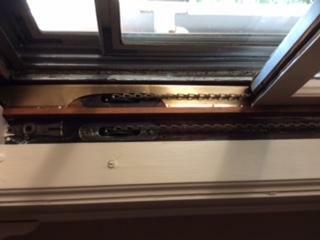 That is why Windowrepair.com, Inc. uses a compression weather-stripping that does not reduce clearance – it just takes up the movement and stops rattling along with drafts, creating a “silky” feeling to the window’s operation. People who have us weather strip all their windows are always impressed with the improvement in draft and noise reduction. Rather than trying to make an old window perfectly air tight- which is impossible to do on a long-term basis – have us add the side weather-stripping and then add an air tight storm- such as the Harvey Tru-Channel Storm Window – and remember – this will give you the same energy performance as a replacement window! Spring Bronze weather-stripping is not only very attractive as it gains a nice patina over time but it lasts well over 100 years and when installed properly giving your windows an effective air seal. Another reason why you should not replace your wood windows but to have Windowrepair.com, Inc. to restore your wood windows!